Chu Eben can still remember exactly how frustrating and depressing life was in the refugee centres – four strangers confined in a twelve square metre room, restricted in freedom of movement, having no money for a language course and not the slightest notion of how and when this “condition of complete limbo” would end. “You can’t leave anyone to live isolated for years in a centre only because he exists in a legal limbo”, says Chu today. Today – that is 17 years after the Cameroonian refugee reached Germany. He was lodged initially in a refugee camp in the town of Eisenhüttenstadt in Brandenburg, under the restrictions, like all refugees, of the residence obligation, which allows those concerned to leave their assigned district only with the permission of the immigration authorities. The refugee agency of the United Nation UNHCR has called this regulation incompatible with international law and appealed several times to the German authorities and courts to review the residence obligation – to no avail. In most German federal states asylum seekers are also not allowed to go directly to a doctor or call an ambulance without previously receiving permission from the responsible authority. A constant strain on body and soul, as Chu says. According to the UNHCR, in 2014 about 73,000 asylum applications were submitted to the German authorities. Between 20,000 and 30,000 people received from the administrations only provisional papers before an asylum procedure could be started at all. Many refugee-initiated projects now want to remove restrictions. For example, the Berlin Oranienplatz, which refugees from all over Germany occupied with a camp in protest against the German asylum policy, has been cleared, but the movement behind it continues. “With the occupation of the Oranienplatz we’ve shown the refugees of Europe that they can fight”, says the 33-year-old Adam Bahar, who in 2012 fled from the Sudan across eight countries to Berlin and lived in one of the tents in the square. He is still politically active and organizes information events and protest marches. Mbolo Yufanyi has also for many years stood up against the social exclusion of people seeking protection. Since his life was in danger in Cameroon, he fled in 1998 to Germany and in 1999 became a member of the refugee organisation The Voice Refugee Forum Deutschland. “For us it was then clear: we have no choice, but we have a voice”, says Yufanyi. 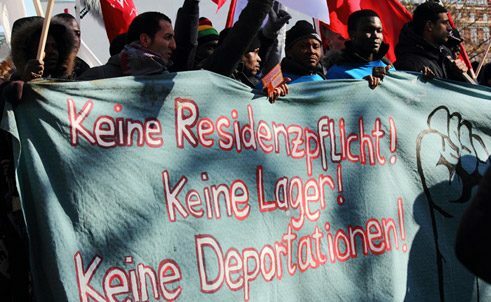 From Mühlhausen in Thuringia he and other committed refugees work to expand the movement to other federal states and organize large campaigns against the residence obligation, deportation, practices in prisons and police brutality. The main objective of The Voice is still to assist refugees in the fight for their rights and to bring home to them that they must themselves engage in the struggle, says Mbolo, who has a PhD in forestry. “We live in a society where every day we experience that we’re not wanted. Refugees have the lowest social status of anyone. There is now no longer an inner-German border, but there are still plenty of borders against foreigners.” Nevertheless, it is apparent that refugees are increasingly organizing themselves and fighting for their rights. “In order for them to have a better chance in the future, networking is the be-all and end-all”, says Mbolo. Nicole Sagener works as a freelance journalist, based in Berlin. She writes for various publications, including “Zeit Online” and “Tagesspiegel”.